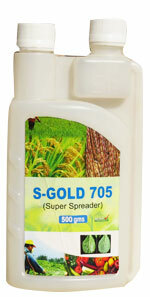 S-GOLD 705 is an unique and versatile super spreading agent, specifically formulated for application in Agro Industries. This Super Spreading Agent improves the wettability and penetration. It increases the efficacy of pesticides and other nutrient foliar sprays by ensuring even spreading on the surface of leaves. S-GOLD 705 is a concentrated multipurpose super spreading agent, containing a blend of biodegradable, non-ionic surfactants and an emulsified silicone type anti-foam preparation. S-GOLD 705 is biodegradable, non-ionic, non-toxic and does not contain any phosphates. It is designed primarily for use with agricultural chemicals applied from a water base spray, including wettable powders, water soluble mixtures and oil-in-water concentrates. When used in agrichemicals the welling action is a result of the reduction of surface tension in the solution. This action provides uniform wetting and coverage. When used in a herbicide solution, this spreading agent assures superior weed control while practically eliminating foaming and incompatibility problems in the spraying system.